Description White Orchid PearlBACKUP CAMERA, LEATHER, HEATED SEATS, BLUETOOTH-HANDSFREE, SUNROOF/MOON ROOF, 7 Speakers, Automatic temperature control, Brake assist, Delay-off headlights, Electronic Stability Control, Exterior Parking Camera Rear, Front dual zone A/C, Front fog lights, Fully automatic headlights, Heated front seats, Memory seat, Perforated Leather-Trimmed Seats, Power moonroof, Radio: 360-Watt AM/FM/CD Premium Audio System, Steering wheel mounted audio controls, Telescoping steering wheel, Tilt steering wheel.Features:CARFAX One-Owner. 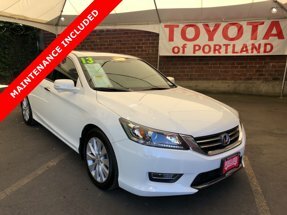 Clean CARFAX.27/36 City/Highway MPGReviews: * Simple operation, great reliability and high resale value are obvious attractors to the Accord. But you may be surprised at the extent of its lineup, which ranges from an economical sedan to a V6-powered coupe or a hybrid rated up to 50 mpg. It's hard to go wrong in any of them. Source: KBB.com * What began as a 2-door hatchback in 1976 has grown into today's full-size sedan. Like the rest of the car, the Accord's 5-passenger interior is a pleasing step forward. The cabin boasts soft-touch materials for a quality feel. The front seats are comfortable, and the driver's seat actually toned down the lumbar support. The rear seats have even more room, as does the trunk. Sleek, rippled sheet metal defines a more streamlined exterior that has shrunk around an interior that feels roomier than previous generations. The most surprising thing about the Accord is its refined continuously variable transmission (CVT). Mated to the 4-cylinder, this CVT feels much like a normal automatic, mimicking gear changes. Even a base Accord has good power for acceleration and passing, yet attains an impressive mileage on the highway. Move up to a V6 model with 6-speed automatic transmission, and the Accord is downright quick. For the individual looking to consume less the Accord comes as a Hybrid as well. This operates on a 141hp 2.0-liter, 16-valve i-VTEC 4-cylinder engine and a 55hp lithium-ion battery pack for a net hp of 196. The Hybrid can achieve ratings of 50 cty and 46 hwy. To help maximize efficiency, the Accord Hybrid seamlessly shifts between three distinct drive modes: EV Drive, Hybrid Drive and Engine Drive. EV Drive is 100% electric, and generally is used during braking and when starting from a stop. Hybrid Drive uses the fuel engine and electric motor to provide extra zip during acceleration, and once your Accord Hybrid is cruising with highway efficiency, Engine Drive takes over. If you want a hassle-free, pleasing family car with a reputation for quality and an immediate familiarity, you can't go wrong with the Accord. Source: The Manufacturer Summary * Roomy and high-quality interior; refined and efficient powertrains; quick acceleration; responsive handling; generous standard features; available coupe body style. Source: EdmundsAwards: * 2015 KBB.com Brand Image Awards2016 Kelley Blue Book Brand Image Awards are based on the Brand Watch(tm) study from Kelley Blue Book Market Intelligence. Award calculated among non-luxury shoppers. For more information, visit www.kbb.com. Kelley Blue Book is a registered trademark of Kelley Blue Book Co., Inc.